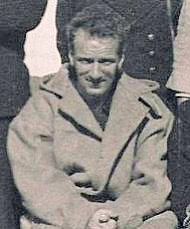 David MacDougall was on his second tour of duty in the Colony. He was posted back to the Colony as the Director of the Ministry of information when hostilities in Europe began. In Shaoguan (Kukong) the local mission doctor operated on Mac unsuccessfully, and he was then flown, along with other members of the escape party to Chungking for debriefing. 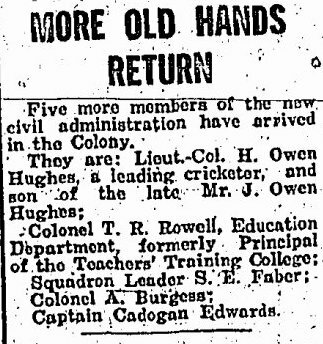 The arrival of Cmdr Hugh Montague RN (Rtrd), Police Supt Bill Robinson of the Indian Police Intelligence unit, Captain Peter Macmillan, Captain Reginald (Freddie) Guest, Sq-Ldr Max Oxford, all staff officers of HKBHQ, David MacDougall, and Edwin (Ted) Ross both of the Ministry of Information in the early hours made the British national and regional press the same day 15th January 1942. It was widely believed among his fellow escapees that Mac was an inteligence officer, Mac denied that he had any connections with the inteligence services. Mac also declined an offer of $2000 by the US press for an exclusive account of the escape. He also declined a lucrative salary package to stay in Chungking and Calcutta. Mac flew out from Chungking on Sunday 25th January to the Canadian run "West China Union University Hospital" at Chengtu in Szechwan Province. After locating the bullet by Xrays they operated the following day. As soon as I arrived here I got a decent X-ray on me (various doctors on the way to Chungking had probed unsuccessfully for the bullet) and they found the bullet under the left shoulder blade, jinking about among my ribs. It had smashed through the shoulder blade and was fairly deeply embedded. They operated last Monday (26th Jan) but failed after two and a half hours to get the bullet. But there was no infection and no puss and in the end they decided to leave it in, and sewed me up again. They say it won’t do any harm. They are absolutely first class people – very highly paid Canadians. I had a hellish four days after the operation, and had to have a lot of morphia, but I’m all right now; am getting up part of the day and eating like a horse. 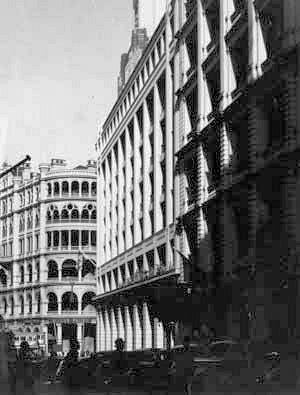 After convalescing at the Surgeons house Mac flew back to Chungking for a short period before leaving on the 20th February when Mac embarked on a ten day journey by air via Calcutta to Lagos, Nigeria, where he stayed with the Chief Colonial Secretary Alexander Grantham for several weeks before travelling on to London where he arrived in mid March. 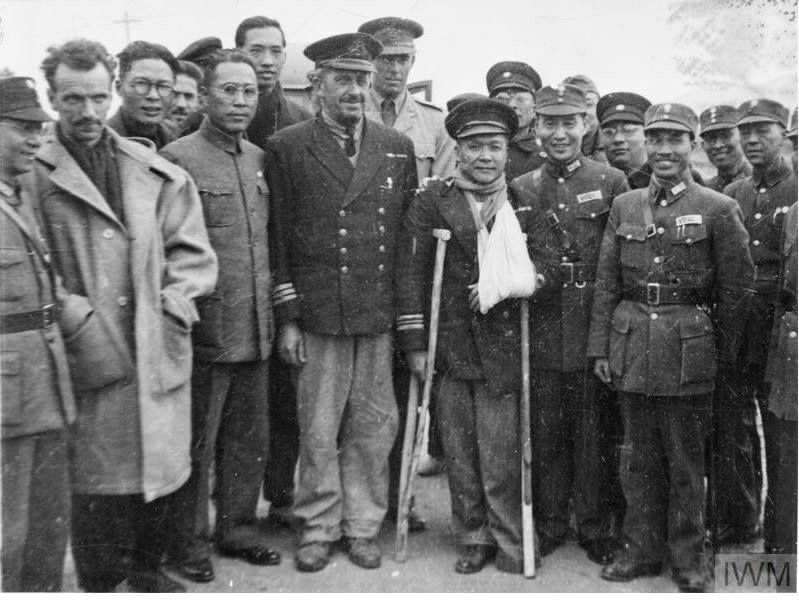 Admiral Chan Chak and David MacDougall revisited Aberdeen together on Sunday 26th May 1946 and reminisced over their incredible Christmas Day escape five years earlier. Translation by Chi Man KWONG. Research Assistant Professor, History Department, Hong Kong Baptist University. 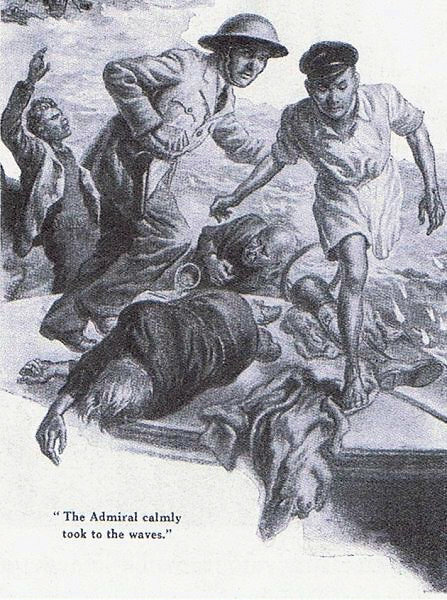 Admiral Chan Chak kept the bullet removed from his left wrist, and had it mounted on a gold chain to wear on his lapel as a permanent reminder of his incredible escape from Hong Kong. After the war Chan became the first post war Mayor of Canton. The Ministry of Information (MoI) was a Government department to maintain public morale through the use of publicity and propaganda via the media. Home intelligence was a department within the MoI used to observe the public and monitor their mood, gathering intelligence from the likes of shop keepers, publicans, clergymen, shop stewards, as well as G.Ps, letter opening and phone tapping. The MoI also produced propaganda films for public showing. 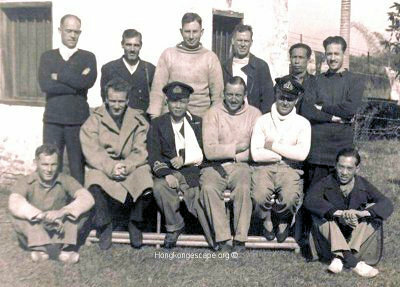 Adm Chan Chak and his liaison party were brought in to work with Mac in keeping the majority Chinese population onboard. In 1944 Mac was appointed head of the Hong Kong Planning Unit within the authority of the Colonial Office. The unit was eventually incorporated into the armed forces as civil affairs staff, and MacDougall given the rank of Brigadier. Thus began a game of political chess with the Americans and Chinese for the restoration of British Sovereignty in post war Hong Kong as the prize. He returned to Hong Kong on the 7th September 1945 as Brigadier Colonial Secretary in time to witnessed the official Japanese surrender to Adm Harcourt in Government House on the 16th September. Left: David MacDougall, (arrowed) standing next to Lt. 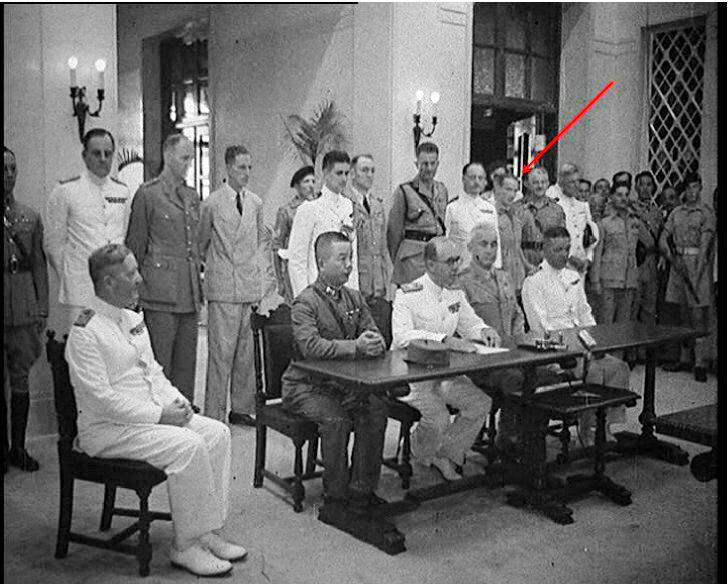 Colonel Lindsay Ride, with Major General Francis Festing (Frontline Frankie) C-in-C Hong Kong 1946-49 standing next but one, returned as Brigadier Colonial Secretary 7th September 1945 and witnessed Maj.-Gen. Umekichi Okada and Vice Admiral Ruitaro Fujita sign the instrument of surrender in Government House 16th September 1945 to British officers led by Admiral Sir Bruce Fraser, 1st Baron Fraser of North Cape, sitting extreme left. At the table L-R are Major-General Pan Hwa Kuei ROC, Rear Adm Cecil Harcourt, Colonel Adrian Williams, US Army and Captain W B Creery Royal Canadian Navy..
Civil administration was restored when H.E. Sir Mark Young was sworn in on the 1st May 1946 and military administration under Vice Admiral Sir Cecil Harcourt was disolved. Mac remained in his position as Colonial Secretary. Mac remained in Hong Kong from 1945 - 1949, with a brief period as acting Governor after Mark Aitchison Young (楊慕琦) from 17th May through 25th Jul 1947 when Alexander William George Herder Grantham took office as the 22nd Governor of Hong Kong. Mac had very strong views on how Hong Kong should be run, and was not at all comfortable with Colonialism, refusing to acquire a sword or uniform. As well as achieving academically he excelled at sports winning awards for Golf, Rugby, and tennis. He was an ardent reader of the Polish author Joseph Conrad which inspired him to travel. He was a modest man and learnt Cantonese fluently and a little Mandarin which put him in good stead for his post-war office as Brigadier Colonial Secretary of Hong Kong. Mac remained good friends with Admiral Chan Chak, the former President of the Southern Kuomintang Nationalists party (KMT) and now the first post war Mayor of Canton. Max Oxford returned to Hong Kong as Deputy Director of Kai Tak airport. He quickly restored the administration in Hong Kong to a level of efficiency that made it the most shining example of all the territories liberated from the Japanese. David changed the administration from the pre-war British colonial ruling class system to a very much Chinese integrated administration which led to the eventual handing back of Hong Kong to China in 1997. 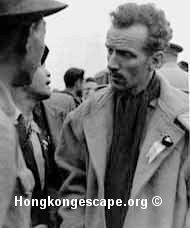 Lt-Colonel Harry Owen Hughes returned to Hong Kong on the 12th September 1945 as part of David MacDougall's civil admin team. 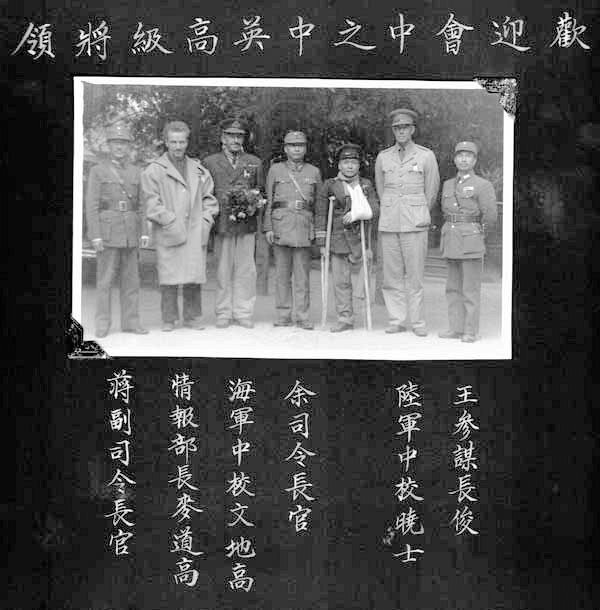 Harry also Commanded the post war Hong Kong Volunteer Defense Corps.